A historical investigation into the Sea Point beachfront as a public open space throughout the 20th century with special reference to memories of growing up along the Sea Point Promenade by Leila Emdon. 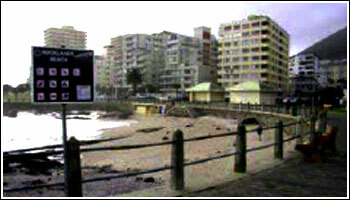 The Sea Point promenade was a safe and clean environment where the community made use of all the public facilities. After 1948, this was to become exclusively reserved for whites only. During the earliest years of Apartheid, 1949-1953, the National Party passed racebased laws that intensified restrictions to social and political life. “Apartheid legislation intensified the radicalisation of space in the country and bestowed upon white people greater privileges then before.”44 “Demarcated space informed race identity, stimulated feelings of marginalisation, provoked agency and encouraged compliance.”45 The Sea Shore Act of 1935 obliged residents of the city to bathe in racially separate bathing areas. During the 1940s whites and blacks swam in different municipal swimming baths and the main beaches were segregated. Segregated bathing, however, had long been practised in Sea Point. 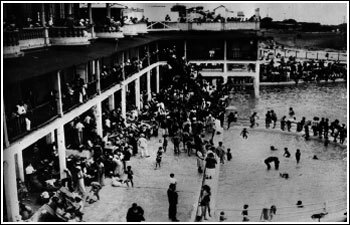 By 1913, whites patronised the Sea Point Pavilion and around 1917 the city constructed a bathing pool, the ‘Non- European Pavilion’, for coloureds near Queens beach near the Sea Point railway station. 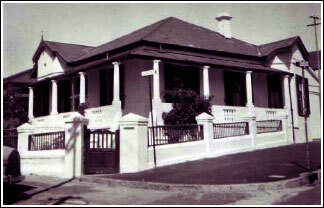 While the naming of the Pavilion for whites both identified whites with the suburb and reinforced the notion of the suburb as a space for white people, the naming of the recreational site for coloureds emphasised the marginalisation of coloureds in Sea Point.46 The coloured residents of the area could only enter the Pavilion if they were a servant of a white family or were doing work in the Pavilion. Sandra also describes how her family was always aware of Apartheid. 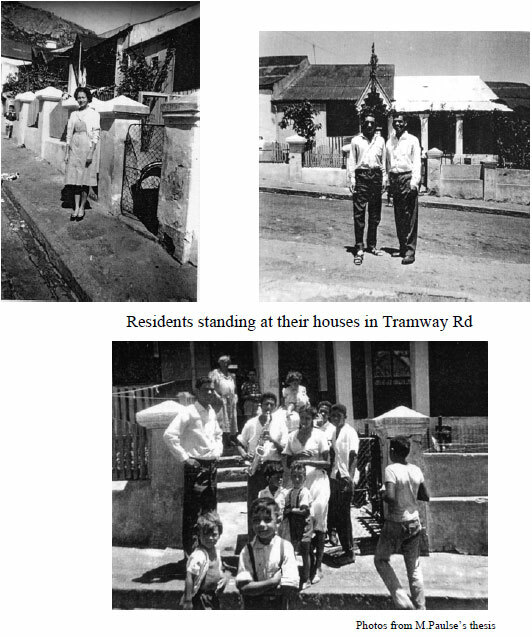 She also lived close to Tramway road and knew the people. “I lived near Quendon road which was near Queens’s road and there was a coloured township nearby called Tramway Road. I feel very sad about Tramway road. In the 1990s, the people were supposed to have their land back but many did not reclaim it and now it is overgrown. As a child these coloured families lived there, we shared a wall. I used to climb up a ladder go over the wall, through their little lanes to get to school. It was safe. They were a wonderful community.”49 Both Sonia and Sheila also remember Tramway road and were aware of the exclusion they experienced about the apartheid. Residents that I have interviewed do not adopt a racist attitude but more one that resembles a Cape Liberal tradition. They were against Apartheid. While some did what they could to support the resistance, others realised that unless you were willing to fight, not much could be done. Although there were not many shops, there were eventually four movie theatres in Sea Point. This was an important aspect of Sea Point residents’ social lives. 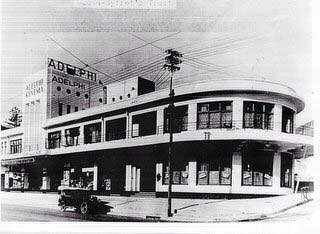 On the weekends, young people would attend the Adelphi cinema, The Odeon, either the Marine or later the Metro Cinema. It was easy for young people to move around. It was safe enough for them to walk at night and public transport was cheap and reliable. Today there are no more cinemas left in Sea Point, this is an indication of how Sea Point would later lose it qualities of being a family suburb. There are many beaches along the promenade. Each beach has a different feel to it and many people in Sea Point would have their particular beach that they would flock to in the summer. 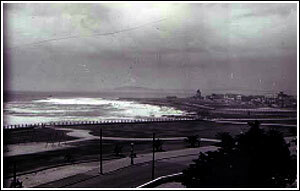 From the decades of the 30s and 50s, the beaches were markers for the social divisions in Sea Point. 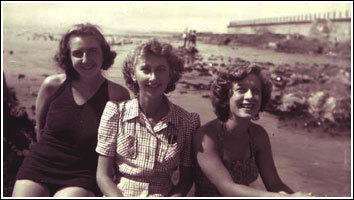 Starting at the end of Sea Point with Saunders, where many people like Sandra and Sonia would go with their friends. Then closer to the pavilion is Queens beach where coloured people were allowed to go. After the pavilion is Milton Pool where a large tidal pool was made as still stands today. Along this beach, you can find Graafs pool. As you go further along the promenade, you will find Rocklands beach, my Sea Point beach of choice and the one where Sheila Vaughan as well as Rosemary Magid spent most of her youth. It was not as though there was conflict between people but rather that you would go to the beach you lived close to and it became your ‘turf’. Daniel Vaughan remembers; “In summer the beaches belonged to us, and homework would if at all possible be left to when it was too dark to swim or canoe. Our tin canoes, made from flattened sheets of old corrugated iron were the surfboards of those days and summer afternoons seemed endless with surfing or ‘reefing’ or just paddling about. It made no difference to our fun when the summer westerly blew; we learned to be careful in a strong south-Easter. Rosemary remembers how when she was a teen you were proud of your beach and remained loyal to it. “We were a clique of swimmers that became almost like family. 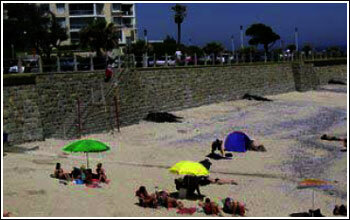 The pools along the Sea Point coast have an interesting history in that for decades people have enjoyed bathing. Today there is still the Milton Pool and the Saunders pool. Given the rough sea along the coast, these rock pools were made to be tidal pools, making it easier for people to swim. Opened in 1895, the Sea Point baths were built at the foot of Church Road. 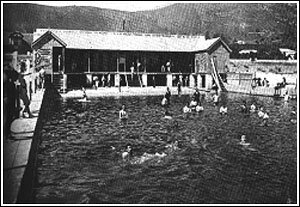 Above the pool, there was a wooden structure with cubicles, and there were, of course, separate bathing hours for men and women.26 The baths lasted until 1911 when a storm washed them away. Everyone I have spoken remembers with Joy the Vic Davis band, a treat for young people and brought many good memories. The Pavilion was later rebuilt to accommodate more people. All those I interviewed had a different experience of Sea Point. Joe Maureberger describes how: “There many children and the schools were packed, so there was no lack of friends.”17 The suburb was growing and many schools, churches and synagogues were opening. Sheila describes how: “Before the exodus of some families Sea Point was teaming with happy children. Schools and churches were packed, providing social activities as well as learning.”18 There were two large high schools, namely Ellerslie Girls High and Sea Point Boys High.